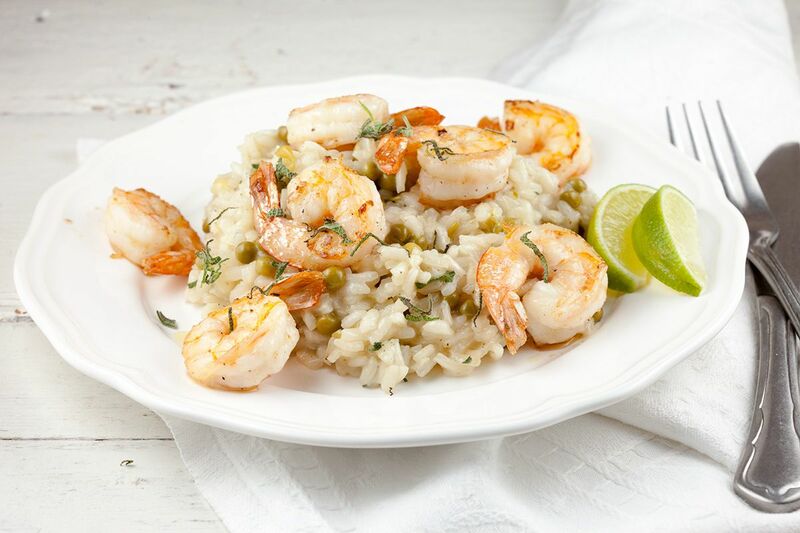 Risotto with shrimps and peas is extra delicious because of the addition of fresh sage and lots of garlic for the garlic shrimps. Mmm! PEEL the onion and garlic cloves. Finely CHOP the onion and 2 of the garlic cloves and chop the other 3 garlic cloves into halves. CLEAN the shrimps, we like to keep the tails attached. BOIL water in the kettle and pour it into the measuring cup along with the vegetable stock cubes, or you can also heat the vegetable stock up in a pan. HEAT a large splash of olive oil in the large skillet on low heat and ADD the halved garlic cloves. Let the oil absorb the garlic flavor and then REMOVE the garlic. CHOP the lime into wedges and set aside. HEAT a bit of olive oil in the second large skillet and sauté the onion and finely chopped garlic for a few minutes. ADD the risotto rice and cook this a few minutes more, until the rice looks glossy. 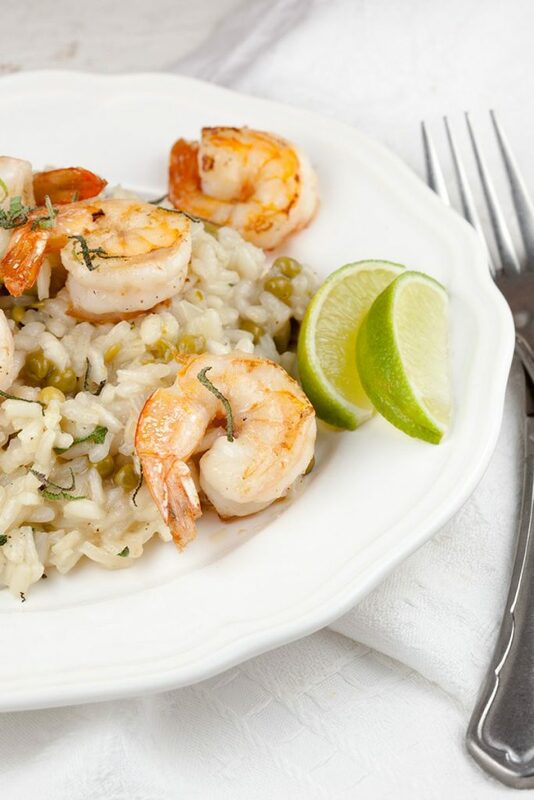 POUR in the white wine, you’ll notice the rice will absorb the wine very quickly. Gradually POUR the stock into the risotto, one spoon at a time. ADD the next spoon when the stock has been completely absorbed. ADD the peas to the risotto as soon as the risotto is almost done. SEASON withe pepper and salt. HEAT the garlic oil on high heat and cook the shrimps for a few minutes. SEASON the shrimps with pepper and salt as well. 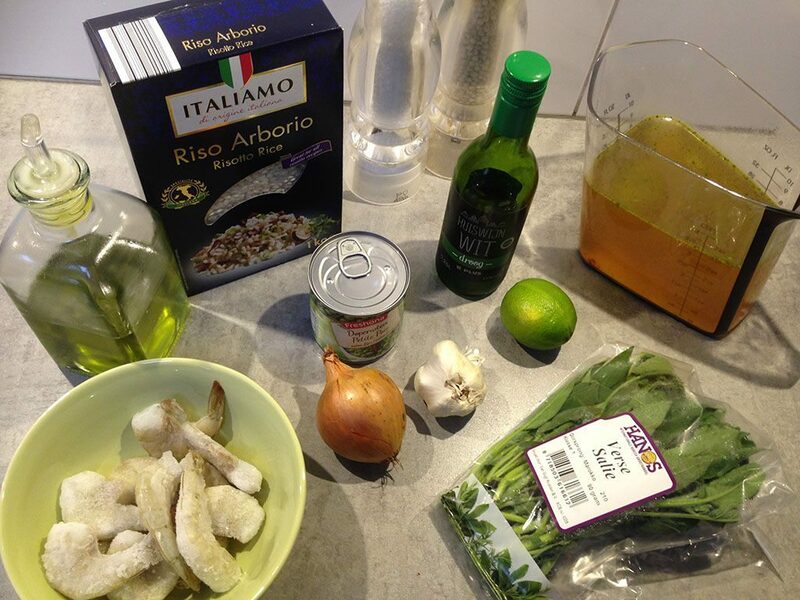 Finely CHOP the sage leaves and stir half of it into the rice and use the rest for garnish later on. If you like, you can also stir in some grated parmesan cheese for extra flavor. 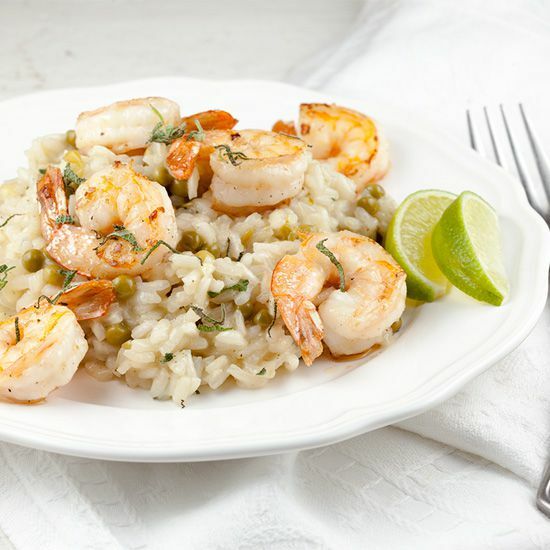 SERVE the risotto with the garlic shrimps and GARNISH with sage and wedges of lime. Enjoy!